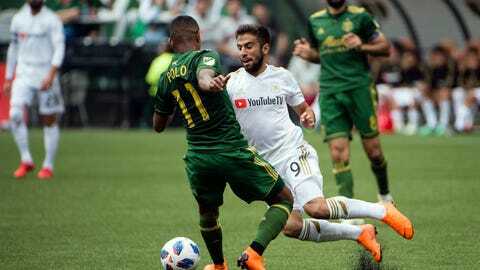 PORTLAND, Ore. (AP) Samuel Armenteros scored his first MLS goal in the 81st minute and the Portland Timbers won their fifth straight game with a 2-1 victory over Los Angeles FC on Saturday. Carlos Vela tied the match for LAFC in the 74th minute after Cristhian Paredes scored for the Timbers to open the second half. The Timbers (5-3-2) are 4-0 at home after starting the season winless for five straight matches on the road because of construction at Providence Park. Expansion LAFC (6-3-2) dropped just its third match on the road this year. The Timbers broke through with Paredes’ goal in the 52nd minute, which came on a rebound of Diego Valeri‘s free kick. It was the first MLS goal for the Paraguayan midfielder, who just turned 20 on Friday. Vela curled a shot over Timbers’ goalkeeper Jeff Antinella for his team-leading seventh goal of the season. It snapped Portland’s run of 353 minutes without conceding a goal. Armenteros, who was subbed in for Fanendo Adi in the 75th minute, scored some six minutes later and celebrated by running up the stairs behind the goal to the stands where he hugged Timbers Army supporters. Portland had three straight shutouts heading into the game, but they got hit in the ninth minute when defender Liam Ridgewell left the game with a non-contact injury. Although he was able to walk off the field unaided, he was replaced by Julio Cascante. Adi had a clear strike that caromed off the crossbar in the ninth minute for probably the best chance in the first half. Both teams are likely to see World Cup absences as early as next week. Officially, MLS teams don’t have to release players until May 28, although it’s likely they’ll let them go sooner in the interest of good relations with the national teams and their federations. The Timbers have two players that were on provisional World Cup rosters released earlier in the week. Midfielder David Guzman was on the roster for Costa Rica, which went ahead and named its World Cup squad, so he’s likely assured a spot in Russia. Midfilder Andy Polo was named to Peru’s provisional roster. LAFC’s players named to preliminary rosters include forward Carlos Vela (Mexico), forward Marco Urena (Costa Rica), Steve Beitashour (Iran) and defender/midfielder Omar Gaber (Egypt). Defender Laurent Ciman is expected to be on Belgium’s provisional roster, which will be announced Monday. Urena is recovering from facial surgery and was not available for LAFC on Saturday.